Blacksmith Will Turner teams up with eccentric pirate "Captain" Jack Sparrow to save his love, the governor's daughter, from Jack's former pirate allies, who are now undead. This may actually be my favorite pirate movie! A while back I bought the Blue-Ray boxset with all four Pirates of the Caribbean movies, and I only recently started watching them (again - I saw then at the theater when they came out of course!). 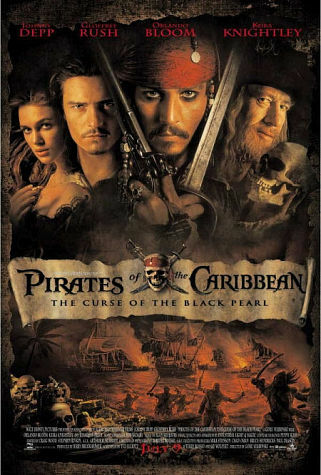 Even though I really like all of them, I do think that the first installment The Curse of the Black Pearl is the best of them. I like the way that we are introduced to a wide range of pirate myths and how superstition, pirate attacks ets. is handled as a part of everyday life. I am also a huge fan of Johnny Depp. He is a brilliant actor and just perfect as Captain Jack Sparrow. Orlando Bloom also does a good job, and even Keira Knightley is good in this movie. The effects are good. The cannons, the ships and the curse of the Black Pearl are all very well done. If you like pirate movies, this is an absolute must see. If you like Johnny Depp, his performance here is both entertaining and skillful.